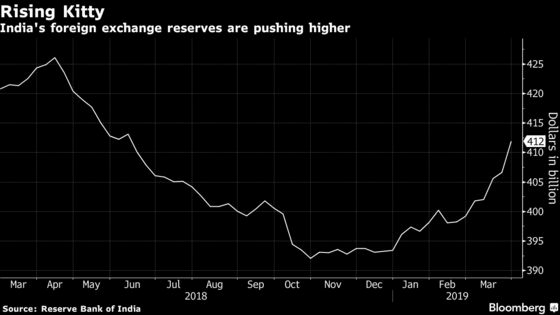 (Bloomberg) -- The Reserve Bank of India’s brand new liquidity-management tool -- a dollar-rupee swap window -- is likely to lift the country’s foreign exchange reserves toward record highs, helping it tide over external risks, economists at HSBC Holdings Plc said in a note. The success of the $5 billion of three-year swaps in March prompted the RBI to announce another auction for a similar amount and tenor in April. With robust foreign inflows expected into local assets, chances are high the RBI may conduct a few more. That doesn’t mean the RBI should stop outright dollar purchases, she said. India’s foreign exchange reserves were at $412 billion rupees in end-March, which Bhandari says is enough to cover more than 10 months of imports. Last year, the RBI had to draw down significantly from its reserves, depleting it to $392 billion in October from a record $426 billion, to defend the rupee amid a surge in prices of oil, India’s biggest import, and the dollar’s rise. Foreign inflows chasing higher yields in India saw a revival in early 2019, but policy makers are wary about their reversal. “From this perspective, an additional $20 billion of reserves, taking overall holdings to $430 billion, would provide an extra, useful cushion in a world of increased financial volatility,” Bhandari added.